I don’t know what it is about gardeners that we tend to gush about a favorite flower that is blooming or a shrub that looks just as we dreamed it would, and then, in the next breath, complain about something that is making our gardens less than perfect. I hear this all the time, and I am just as guilty as the next gardener. There are weeds in the beds, trimming that should be done, or any of the “if onlys” that spring to mind whenever we are in a “glass half empty” mood. I was thinking about this as I was watering the garden this afternoon after work, when I suddenly noticed the ornamental sweet potato vines. Usually by this time of year they have hundreds of tiny holes in the leaves, but not this year. There are no holes from beetles this year which is a surprise since the last few years has been pretty bad for chomping insects. Margarite is clear and so is Ace of Spades. So, while I almost started this post by lamenting that I just can’t get back into any kind of routine after the recent Hurricanes, weeds are popping up like crazy, and I never seem to have time to read garden blogs like I used to be able to do, I was stopped short. There is something positive to look at instead. Maybe I should try to do this more often. 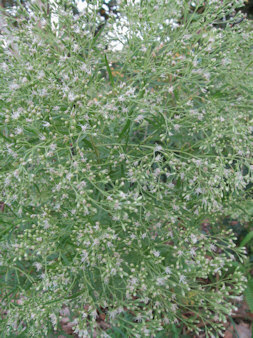 I have often written about how many new weeds have shown up in the garden since Hurricane Katrina blew through. Many gardeners here have said the same thing. Well, last year a new plant volunteered in the garden. It was green with delicate, cut leaves. I let it grow, trying to figure out what it was. 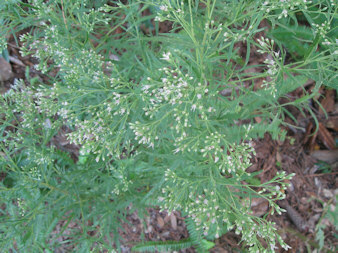 It looked like it could be some sort of wild artemisia. It continued to grow slowly and the fine textured foliage made a nice contrast to the daylilies around it. This spring, it returned, a little bigger, so I decided to move it since I didn’t want it crowding out the daylilies. I moved it to a shadier location in an area I was redoing that had few plants and so there was space for it. It thrived. I continued to try and find out what it was but no luck. Now it has started to bloom. The flowers are tiny and almost look like little tufts. This is probably some terrible weed that I should immediately remove, but curiosity is winning out. I am thinking about trimming off the flowers before they go to seed just in case this is some noxious weed that no one in her right mind would have in a garden. Here is a picture that shows the foliage. 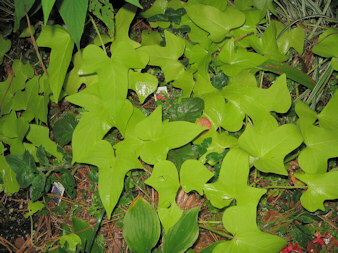 The leaves are very finely cut, but as it grows the ones on the top change slightly and are not as lobed. I have looked all over the Internet and in my garden books, but can’t find any info on any weed or wildflower that looks like this. Any ideas? Anyone? I have often been puzzled why certain flowers change color with the temperature. 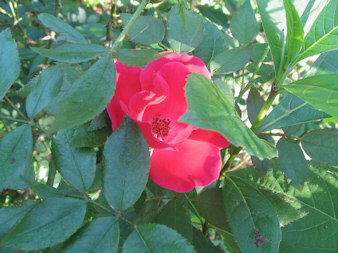 This happens to the Knockout roses, and some camellias I have in the garden. I find the colors the flowers are in cooler temperatures to be the ones I like best. The change is not dramatic but noticeable, for example dark pink to a lighter pink. I finally looked up the reason this happens and found that flower color is dependent on color pigments that can be affected by temperature and can change depending on that temperature. 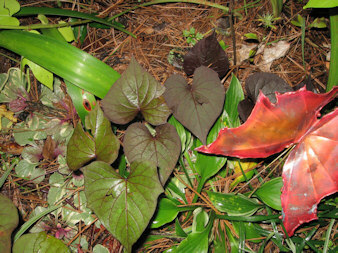 This is one reason why flowers with vibrant colors in northern gardens tend to pale in southern ones. Since we have been having unseasonably cooler weather here lately, I have noticed the Knockout roses have started blooming in what I think of as their original colors. The original Knockout has returned to its more cherry red color. 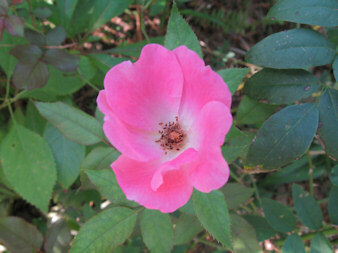 The Pink Knockout has shown up its darker pink color rather than the paler pink it displayed in the summer heat. 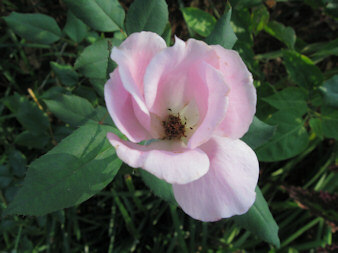 And, Blushing Knockout has its lovely soft shell pink color. This one changes the least in the hotter temperatures. In this post of late summer roses, I showed how these roses’ colors looked so similar. Now, I am glad with the arrival of cooler weather that these flowers have returned to their true colors. Lately we have been having some unusually cool days for September. The type of weather that comes in October here in Louisiana. Don’t get me wrong, I am not complaining. It has been lovely weather, but a reminder that colder temperatures are coming. I love the changing of the seasons. It seems to give us something to look forward too. I will admit that autumn is my favorite season, but it brings with it the promise of winter, holidays, and get togethers with family and friends. I am very fortunate to live in an area where we can garden just about all year, so our gardens never really go to sleep as they do in colder areas. 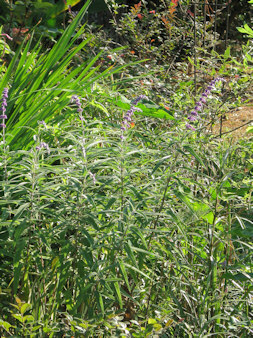 But, to get back to changing seasons, the Mexican sage is starting to show their purple blooms. I know other gardeners’ sage has been blooming for weeks, but, here, it is just starting. I am so glad I was reminded in early summer to cut it back to make it bushier. This year it is not flopping over as the blooms get bigger. I serendipitously planted it to the side of some Mexican petunias and the repeating color looks very good in that section of the garden. The purple spikes of the sage makes a nice contrast to the purple trumpets of the ruellea. Because this plant blooms when the days grow shorter, I guess this is one more definite sign that even though there are still hot days ahead, winter is on its way. A new plant for the garden. Last fall, when I attended the Garden Show at the New Orleans Botanical Gardens, I saw this spectacular, towering herbaceous shrub. It took a little detective work before finding out it was Clerodendrum indicum or Turk’s Turban, skyrocket, or tubeflower. Luckily, (for me) they had some for sale and one came home with me. It was in a gallon pot and about two feet high, so I felt I needed to wait until spring to plant it in the garden. This spring I planted it, and it grew slowly until about July and then it took off. I see now why one of its common names is sky rocket. It was hard taking a photograph of the flowers because of the height. 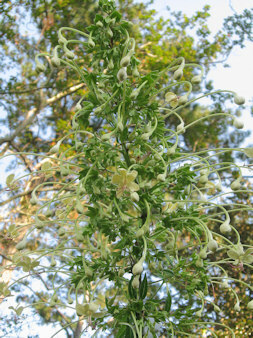 It is about ten feet high with these huge inflorescence (about 16 inches long) with wonderful creamy flowers. 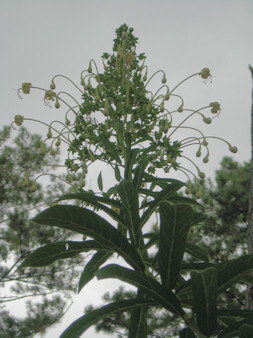 The flowers are on short tube-like stems and droop down so they are very visible. The sepals will turn a deep red and remain on the plant through winter, and the seeds are also supposed to turn from green to a metallic blue. The plant I purchased had the red sepals but not the seeds, so I can’t wait to see the red and blue together. These plants are only hardy to zone 8, and I think that it may freeze to the ground here. Even though I am located in south Louisiana, we can get some killing frosts. I plan on mulching it heavily, like I do some of the other clerodendrum I have. 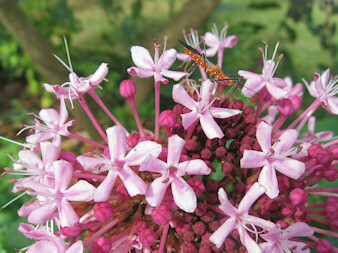 Butterflies and hummingbirds are supposed to love this plant, but I haven’t seen any hovering around mine, yet. I am hoping that it continues to bloom until frost. For an absolutely stunning plant, this towering shrub can’t be beat. Here in the Gulf South, we don’t get the change of leaf colors that our northern neighbors do in the fall. It is just too warm in Louisiana for many of the trees that have the vivid colors in the autumn to do well here. 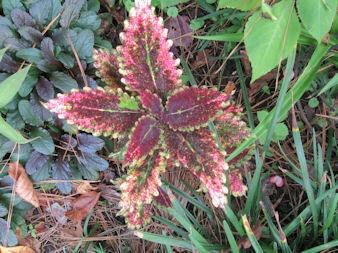 So, we have to mark the change from summer to fall with some of our annuals like the above coleus. It seems to have the right fall colors to put us in the mood for harvest time. 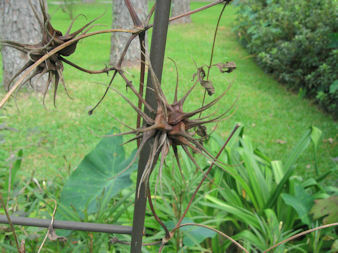 This dried Clematis crispa seed pod looks like it belongs in a Halloween scene. Definitely a sign that summer is over. Even though there are still going to be warm days here in South Louisiana, it is evident that a change has occurred and a new season is underway. This seemed appropriate for the first day of autumn here in Louisiana. We had some more rain today, so there was no working in the garden. Combined with the rain from last night, we had 1.32 inches of rain. We really didn’t need today’s rain, but it did cool things off a bit. I did get out in the late afternoon just to walk around. The mosquitoes were out but not too bad considering all the rain we have had lately. The irises I planted yesterday looked like they made it through the rain okay. I did trim back some cannas and the white lantana. None of the lantana I have in the garden is blooming very well right now. I think it must be because we have had so much rain lately. I find that lantana really blooms well only when it is on the dry side which is why I try not to water them too much, but I can’t help the rain. Well, maybe tomorrow when I get home from work, I’ll be able to do a little weeding. I want to make sure none of the weeds go to seed. I have to really watch the chamber bitters weeds. They look like little mimosa trees, but on the back of the leaves are numerous seeds. I never had these until Hurrican Katrina blew through, but since then they are all over the place. They are not too bad in the garden beds, but they are all over the lawn now. Mowing keeps them in check, but once we stop mowing for the fall, they can continue to grow, so everytime I see one, I pull it. So, today nothing much got done as far as gardening, but maybe this was nature’s way of telling me to take it easy and rest up for next weekend. Here’s a little update on the tree frogs. I was able to snap a photo of one of the little guys this morning. Considering there are so many of them, it was surprising to find only one to photograph. I guess they are camera shy. I saw on the internet a story about a town that is being inundated with tiny toads about the size of our treefrogs. A biologist said it is because of all the rain from TS Faye that the toads laid so many eggs at one time and now they have all reached a size where they are noticible. I bet all the rain we had from Faye, Gustav, and Ike made favorable conditions for an abundance of treefrogs here. I was able to work in the garden today. This is the first time in almost a month. For the last three weeks, all the gardening I have been able to do has been storm cleanup. Today, I planted the Louisiana Irises I received Friday, cut back the yellow lantana that was taking over the circle garden, deadheaded the asters, retied the Mutablis rose to the trellis (it came loose in Ike), cleaned out the yellow daylilies, and cleaned up the border edges of the circle garden. Then I watered everything because some plants were starting to wilt, and I figured it was too dry. An hour or so after I finished, it started raining. Oh, well, it is a soft, steady rain, and we can use it. Our local government had a crew come by yesterday and pick up all the storm debris we had piled on the end of the driveway. Now, our yard looks almost like it did before any of the storms showed up. Because we have a circular driveway, we did not have to place the debris on the lawn. I feel bad for the neighbors who had to put everything on the lawn because now there are bare spots some of which are very large which will not fill in this late in the year. Some lawns look really sad. I am hoping that the rain stops soon so that things will dry out for tomorrow. I still have a lot of gardening to do tomorrow. The last few days when I have been watering the garden, several little creatures have been exposed. There have been scads of teeny, tiny green tree frogs all over the garden. I am so glad to see them because earlier this summer there were very few to be seen which is unusual. 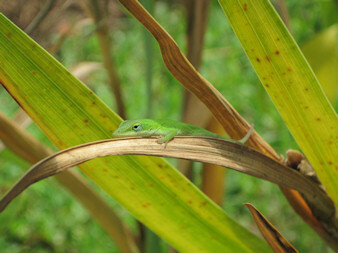 There has also been a ton of small, baby anoles. 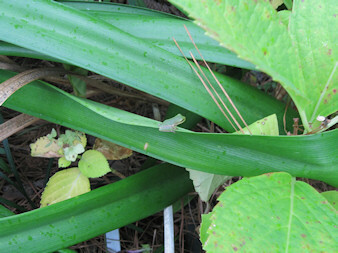 These little green “lizards” are welcome additions to the garden as they are great eaters of bugs. 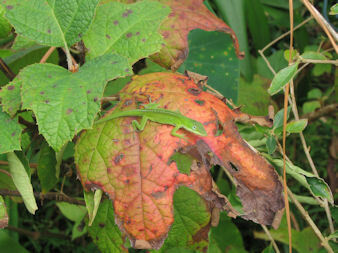 I caught this one lazing on an iris leaf. Visiting the cashmere bouquet flowers was this orange bug that blends in so well you almost do not see him. And finally, little moths are flying out by the hundreds whenever I water. I have never seen so many fluttering about whenever the foliage in the garden beds are disturbed. It seems like they appeared overnight. Just when there are few flowers around and the garden is starting to fade, these little critters start showing up to add a little interest.